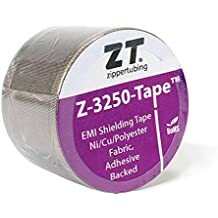 Zipper Mesh - Emi Jackets And Expandable Sleeves - Emi Shielding - Products - ZT | Zippertubing Co.
0.5" 0.625" 0.75" 1.0" 1.125" 1.25" 1.375" 1.5" 1.75" 1.875" 10.0" 11.0" 12.25" 15.0" 2.0" 2.125" 2.25" 2.375" 2.5" 2.75" 2.875" 3.0" 3.125" 3.25" 3.375" 3.5" 3.625" 3.75" 3.875" 4.0" 4.5" 5.0" 5.5" 6.0" 6.5" 7.0" 8.0"
Zipper-Mesh™ cable shielding is a convenient and efficient method of providing EMI/EMP protection to harnesses and wire bundles. 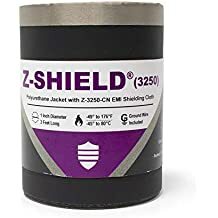 It is a highly-flexible shield constructed of 4-ply knitted wire mesh utilizing an internal shield overlap, an integral grounding strap, and a heavy duty zipper closure. The zipper closure mechanism allows installation to be "tool-free", and re-entry to be very simple for cable repair or modification. Zipper-Mesh™ has no external covering allowing for easy ground termination. Cable Diameter 0.5" 0.625" 0.75" 1.0" 1.125" 1.25" 1.375" 1.5" 1.75" 1.875" 10.0" 11.0" 12.25" 15.0" 2.0" 2.125" 2.25" 2.375" 2.5" 2.75" 2.875" 3.0" 3.125" 3.25" 3.375" 3.5" 3.625" 3.75" 3.875" 4.0" 4.5" 5.0" 5.5" 6.0" 6.5" 7.0" 8.0"